This latest portrayal of original Star Trek characters is marvelous. I absolutely loved every second of it. What Trekkie could pick up this fun comic book and not love it? The Starfleet Academy storyline is interesting as it flashes back and forth between the years 2258 and 2261. At the center, feisty Cadet Nyota Uhura is chasing down answers to the mysterious transmission she stumbles upon and a surviving member of the Vulcan race is wrestling the logical decision to leave Starfleet Academy, and make a life on New Vulcan, or continue her studies. I didn’t know what to expect when I chose this story to review, but I was hoping it would fall right in line with what I know of the Star Trek universe. I’m pleased to say that Mike Johnson did this story justice. Even the introduction of a new set of characters felt as natural as if they have always been apart of this world. The illustrations were also spot on in the depiction of the actors, though at certain angles they took a life of their own. It was like looking at the real Chris Pine or Zoe Saldana without all of their genuine facial expressions. So the characters looked familiar but also new. I’m actually quite surprised that Kirk didn’t play a larger role, but I did enjoy the two female leads. Uhura and T’Laan could not have been more different in terms of personality and physical characteristics, nonetheless they were both amazing characters. Both characters displayed qualities that any young female would look to emulate, making this a read for the younger crowd as well. 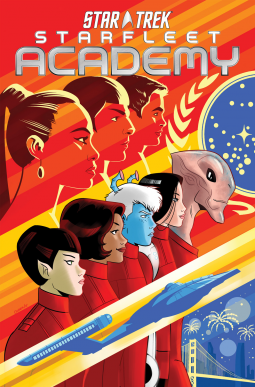 I couldn’t say what the next installment will bring, but I’m hoping its just as full of mischief and mystery as Starfleet Academy. If you were ever curious about what the characters of the original Star Trek series were like during their academy years, then this is the story for you! 11 Books to Read This Summer!